The first cells that arose about 3.5 billion years ago most likely resembled Bacteria or Archaea; they had relatively simple structures and lacked nuclei or internal organelles. Most phylogenetic trees of life show Archaea and Bacteria diverging first from the Last Universal Common Ancestor (LUCA). We infer therefore, that the LUCA had a simple cell structure, with cytoplasm bounded by some type of phospholipid bilayer membrane, and no nuclei or internal membrane compartments or organelles. Bacteria and Archaea are classified as prokaryotes, meaning cells without nuclei, although some modern biologists dislike the term because prokaryotes appear not to form a monophyletic group. Methanococcus janaschii, with many flagella, image courtesy of UC Museum of Paleontology, www.ucmp.berkeley.edu. Bacteria and Archaea have diverse cell morphologies, but they all have some common structural features. small circular DNA molecules called plasmids dispersed in the cytoplasm. cell walls that differ in composition between Bacteria and Archaea. Prokaryotic cells are generally smaller than eukaryotic cells. They have a rudimentary cytoskeleton and can have flagella for motility. About 2.1-2.4 billion years ago, the first eukaryotic cells appear in the fossil record. This coincides with, or occurs soon after, the Great Oxygenation Event. Eukaryotic cell membranes have sterols, whose synthesis requires molecular oxygen. How did eukaryotes arise? One clue is that eukaryotic genes for proteins that replicate DNA and synthesize RNA in the nucleus are similar to Archaeal genes, whereas eukaryotic genes for energy metabolism and lipid biosynthesis in the cytoplasm resemble Bacterial genes. This observation led to the current hypothesis that eukaryotes evolved from an ancient endosymbiosis or cell fusion event between an Archaeon and a Bacterium. Eukaryotic evolution required many innovations. One is endocytosis (taking in molecules bound to the plasma membrane by forming a small vesicle, a bubble-like structure made by a lipid bilayer sac enclosing internal fluid). Modern prokaryotes lack endocytosis or phagocytosis (taking particles into the cell by forming a large vesicle). But endocytosis or phagocytosis is essential for taking in and harboring endosymbionts within a membrane enclosure, and leads to formation of vesicles inside the cell. Invagination of the plasma membrane deep into the cytoplasm to surround the cell’s chromosomes can lead to the formation of a membrane envelope that separates the nuclear compartment from the rest of the cell, and simultaneous development of an endomembrane system. Therefore, phagocytosis/endocytosis can account for the formation of the nucleus enclosed by a nuclear envelope, the endomembrane system, and the evolution of mitochondria and chloroplasts from endosymbiosis of aerobic bacteria and cyanobacteria, respectively. What should students in freshman biology know about the structure of a eukaryotic cell? Rather than trying to memorize details about the various organelles and cell structures, students should think about major cell systems. The cytoplasm is the internal region of the cell bounded by the plasma membrane, excluding the interior of the nucleus and the interior regions of organelles and the endomembrane system. The cytoplasm contains ribosomes, tRNAs and mRNAs for protein synthesis, the cytoskeleton, many metabolic enzymes, and proteins that function in cell signaling. The cytoplasm is so crowded with macromolecules that it has the consistency of a hydrated gel; much of the water molecules are associated with other molecules. The endomembrane system includes the nuclear envelope, the endoplasmic reticulum (ER), the Golgi complex, lysosomes, transport vesicles, secretory vesicles, endosomes, and the plasma membrane. The double membrane of the nuclear envelope is contiguous with the ER. Endomembrane system from Wikipedia. The rough ER has ribosomes bound to the ER membrane. ER-bound ribosomes synthesize proteins into the ER membrane or lumen (internal space). Other ribosomes remain in the cytoplasm and synthesize proteins that remain in the cytoplasm or go to the nucleus or the mitochondria or chloroplasts. That all these membranes comprise a single system becomes clear when we think about membrane biogenesis. For cells to grow, they have to make more membrane lipids and membrane proteins. Membrane proteins for the endomembrane system and proteins for secretion are made in the rough ER (rER) by ribosomes docked to protein channels in the ER membrane. The polypeptide chain emerging from the ribosome passes through the channel into the ER lumen (the interior space of the ER) and begins to fold. Any parts of the chain that form hydrophobic alpha-helices remain embedded in the ER membrane, as transmembrane domains. The newly synthesized proteins in the rER membrane or lumen move to the smooth ER, where they are partially glycosylated (oligosaccharide groups are covalently bonded to particular amino acids). Membrane lipids (phospholipids, sterols) are also made in and added to the smooth ER. Transport vesicles containing membrane proteins and secreted proteins bud from the smooth ER and travel to the Golgi. These vesicles fuse with the Golgi, adding their membrane lipids and membrane proteins, as well as their internal contents, to the Golgi vesicles. In the Golgi, the membrane proteins and secreted proteins are sorted and processed via additional glycosylation. Lysosomal proteins are segregated to vesicles that pinch off and become lysosomes. Secreted proteins are packaged into secretory vesicles that pinch off and are transported to the cell periphery, where the secretory vesicles fuse with the plasma membrane, adding their lipid and protein to the plasma membrane and dumping their internal contents to the outside of the cell. Note that the endomembrane system does not include mitochondria nor chloroplasts, which are independent organelles and will be discussed later in the context of energy metabolism. Proteins destined for mitochondria or chloroplasts, as well as proteins destined for the interior of the nucleus, are made by free cytoplasmic ribosomes (undocked to any membrane). These proteins are then imported into the respective organelles via specialized protein import systems (mitochondria and chloroplasts) or via the nuclear pore complexes (nuclei). Of course, proteins that function in the cytoplasm are also made by free cytoplasmic ribosomes. The cytoskeleton is another cellular system. It consists of actin microfilaments, several types of intermediate filaments, and microtubules. These are dynamic structures required for cell shape, cell mobility, and organization and movement of materials inside the cell. Microfilaments are thinner, and form networks near the plasma membrane to either stabilize or change the shape of the cell, especially when parts of the membrane are extended outward. 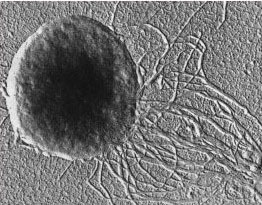 Microtubules (polymerized from dimers of alpha- and beta-tubulin) serve as tracks for movement of transport vesicles and secretory vesicles by motor proteins, and also for movement of chromosomes during cell division. 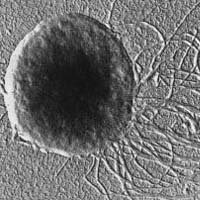 In brief, microfilaments are for cell shape, microtubules are for moving stuff around inside the cell. Outside the cell, overlying the plasma membrane, is the extracellular matrix. In plants and yeast, this is the cell wall. In animal cells, this consists of collagen and other polymers of protein and polysaccharides. The nucleus contains the cell’s chromosomes. All chromosomal DNA replication and transcription to make RNA occurs in the nucleus, as well as RNA processing. The enzymes that perform these tasks, the proteins that bind to DNA to form chromatin, indeed all proteins in the nucleus, are made by ribosomes in the cytoplasm, and then imported into the nucleus through the nuclear envelope pore complexes. Conversely, ribosomal and messenger RNAs are made in the nucleus and exit the nucleus via the same pore complexes, so they can function in cytoplasmic protein synthesis. Watch the Inner Life of the Cell video below, and see if you can identify the various components of the endomembrane system and narrate what is going on. This video is for more advanced students, but the middle of the video, starting with the plasma membrane, beautifully illustrates the dynamic interconnections between the cell structures. The video begins with leukocytes (white blood cells) rolling along a blood vessel. Endothelial cells are the cells that form the inner lining of the blood vessel. Cell surface proteins on the white blood cell interact and bind to the cell surface proteins on the lining of the blood vessel to slow down and stop the white blood cell. From here the video dives into the cell. The plasma membrane is a fluid mosaic of phospholipids and proteins. Sphingolipids and cholesterol make parts of the plasma membrane rigid – these rigid parts are called lipid rafts, that are important for cell signaling. The cell contains different types of cytoskeletal elements – the video shows spectrin, an intermediate filament; actin microfilaments; and microtubules. Let’s not worry about additional details mentioned in the video. Motor proteins “walk” along the microtubules, transporting vesicles back and forth. The “walking” of these motor proteins is powered by ATP hydrolysis. The nuclear envelope contains pores, and mRNA molecules exit the nucleus into the cytoplasm through the nuclear pores. Free ribosomes in the cytoplasm translate and make proteins that stay in the cytoplasm, or partner with special proteins that deliver them to mitochondria and other organelles that are independent of the endomembrane system. Free ribosomes also initiate translation of endomembrane system proteins and secreted proteins, but they stall until they are docked to a protein complex in the rER. The rER is “rough” because all the ribosomes located there gives this portion of the ER a rough appearance in electron micrographs. Membrane proteins are embedded in the ER membrane, whereas secreted proteins end up in the lumen. The membrane and secreted proteins are transported in vesicles to the Golgi. The Golgi completes the glycosylation of these proteins. Secretory vesicles are transported from the Golgi to the plasma membrane, where they fuse. You can ignore the rest of the video, although it’s really cool. It shows how white blood cells squeeze between the cells that line the blood vessel to get into the tissues at a site of infection and inflammation. Written by: Jung Choi on September 27, 2012. Last revised by: Emily WeigelJanuary 17, 2019. Phagocytosis is internalization of particles (like bacteria) by enclosing them in the cell membrane. We don’t need to get into greater detail for an intro course. Endocytosis and phagocytosis are similar; the difference is that endocytosis involves internalization of molecules like proteins that have bound to cell surface receptors. Added phylogenetic tree of life figure for discussion of evolution of eukaryotes.